I’ve been on a major purging/decluttering binge the past few days and am totally throwing sentimentality out the window. If I haven’t used it/worn it in a year: gone. I’ve taken two huge loads to Goodwill, sold a ton of stuff on FB (I’ve made over $300 so far!) and kept our garbage collectors in business this week. I’ve sold a huge number of our wedding gifts. After almost 8 years and 4 moves of never once using those tiny coffee cups and saucers, I’m done. Give me my $5 plastic coffee cup that I use every morning, please. I stopped breastfeeding this week. For several reasons, it was the best thing for both Nolan and me. And although I’m a little sad, I’m 95% relieved and at peace with it. And yesterday I promptly sold my pump, pads, and tanks. It’s strange to think that after 5 1/2 years of a very emotional relationship with infant feeding, I’m almost done, and won’t have to stress over it ever again. I’m torn between wanting Nolan to stay my little baby and also ready for him to grow up a little. 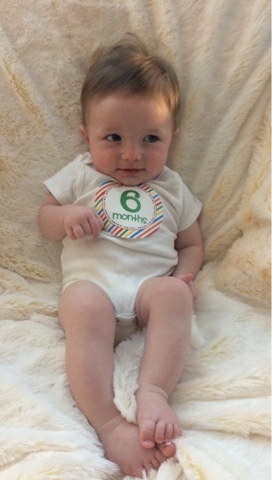 Six months is definitely the baby sweet spot for me, and each day he grows more and more adorable. 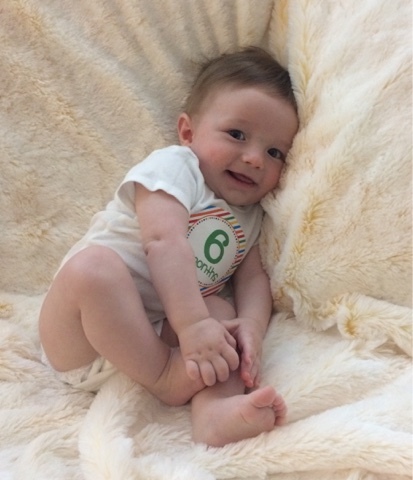 He’s getting close to sitting on his own, grabs at everything, and interacts and communicates more than just with screams. I love holding him, rocking him and relishing his squishy baby-ness, but I’m also looking forward to him playing with his sister at the park and being able to eat a meal at a restaurant with two hands. 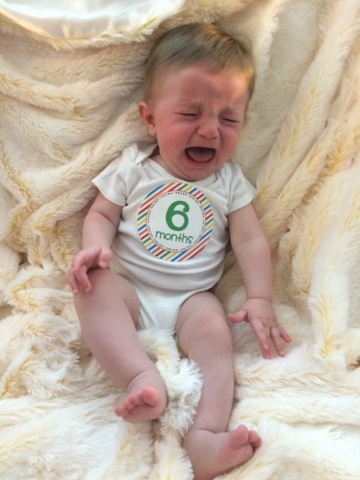 I haven’t started solids with Nolan yet. I know he’s ready, but our high chair is in storage. That’s my official excuse, anyway. The other truth is that ugh, it’s another person to think about feeding, which is just not my favorite. We move in a week and a half, so let the baby-led weaning begin in April! I actually Googled “Potty Training Coach” this afternoon. But for real, is this a thing? Because I’m totally ready to outsource this particular parenting duty. I still have three children in diapers. So what, right? I ordered an over-the-top play set for our new backyard. It’s impossible for me to take my three to the park by myself, so I’m bringing the park to us. Thank you to all of you who offered advice and encouragement a few weeks ago when I published this post. I’m happy to report that things are getting much better with Charlotte and Grayson’s relationship. It’s not perfect, but I’m no longer hearing “mean” words from her on a daily basis, and she even told me today, unprompted, that she likes Grayson. I’ve been heaping on the praise when she helps me with him or gives him a toy and letting her have it (instead of ignoring) when she says something mean or rude about him. I’ve also started talking to Charlotte quite a bit about why Grayson is different. We’ve talked about her brain and what it does- tells her legs to walk, her mouth to talk, and her tummy to hold food. She now knows that Grayson’s brain has a Boo-Boo and it doesn’t tell his legs to walk…etc. The biggest Boo-Boo that she’s had is when she fell and split her lip/chin open and had to go to the ER, and she talks about that a lot, but she also always says that “I got better.” I’m not sure if I should or how to tell her that Grayson’s Boo-Boo isn’t going to get better. Every day, I have to continually make a conscious effort to give Charlotte a lot of grace. Age 3 is all about BIG emotions, and they can easily exasperate me. But that little girl has had a LOT to process in the past year: her Mommy got pregnant and was sick for 9 months, her big brother had major surgery, her little brother was born and cried and cried for months, and then her schedule was thrown into chaos with our house being on the market. All this has nearly driven ME insane, and I have a lot more emotional maturity than a three year old. Poor baby. And now we are about to subject that little girl to the biggest change yet: we are moving in a few weeks. We are so excited and grateful that this is finally happening and are hopeful it will mean a much better quality of life for all of us. However, this current house is all Charlotte remembers and she tells me (in tears) whenever I bring it up that she doesn’t want a new house. She’s been to the new house twice now and her behavior was horrible- silly, disobedient and angry. I’ve been trying to get her excited about a backyard with a playset, a play room, and the sidewalks and cul-de-sac where she can learn to ride a bike. We’ve been to the new neighborhood’s playground quite a few times now, and she does love it, but so far it’s not been enough to convince her that leaving this current house is a good thing. This girl. She’s stubborn, opinionated, hilarious, and smart. 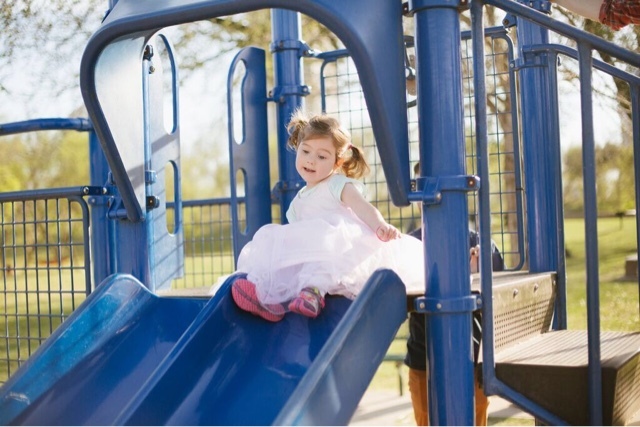 She has her own style (wear a party dress and tennis shoes to the park…why not?) and wants what she wants. She makes me crazy some days, but I love her so and am so glad she’s mine. These days, I have an ever-growing obsession with podcasts. About a year and a half ago, I started reading and hearing buzz about Serial, discovered the podcast app on my iPhone, and was hooked. At that point, Serial season 1 was nearly over, so I binge-listened to that one and started searching for more. Now, podcasts have replaced TV and even blog-reading as my main source of evening entertainment. Honestly, I love that I can become lost in an episode while giving my eyes a rest (crawling under the covers in a dark room with earbuds in? Yes please). I’ve also recently begun listening to podcasts while I drive, which is a nice alternative to listening to music, or the jabbering of a 3 year old. I also realize I now talk about podcasts a lot, just like I talk about blogs. Just this morning at my Bible study, I referenced podcast episodes twice in our discussions. And surprisingly, not a lot of people have discovered the magic that are podcasts. If this is you- give them a try! There are literally thousands, and if you have an iPhone, there’s a little purple Podcast app right on your home screen I bet you’ve never noticed. My list grows weekly, but here are my current favorite podcasts. The Satellite Sisters One of my absolute favorites- 5 real sisters who are all super accomplished in their fields. They are absolutely hilarious and inspiring, and talk about current events, trends, and do TV recaps. And I love that they produce two new shows a week and have a Facebook group for their fans to discuss topics of the shows, or whatever else they want. I do love a good FB group. The Happy Hour with Jamie Ivey For my Christian friends, this one is a must-listen. Jamie interviews a different woman each week- a lot of them are authors- and I am always inspired by their stories and the work they are doing. These are all women who have discovered their passion and are doing something big with it. I love how real their conversations are- it really is like listening in to a happy hour chat. Sorta Awesome I love the content and format of this show. There is one main host and then the 3 other co-hosts rotate through. At the beginning of each show they share an “awesome of the week”- a product, show, app, tip, etc. that they are loving. Then each show has a main theme that they discuss- my favorites have included shows on friendship, anxiety, and Meyers Briggs personalities (the host is obsessed with this and I’ll admit, it’s super interesting to me too). This one also has a FB group with great discussions. The Longest Shortest Time This podcast covers parenting in all sorts of ways. I love it because a lot of the guests are very different than me and my friends, and I love hearing about others’ experiences and points of view. The Big Boo Cast Anyone who knows me well knows how much I adore Melanie Shankle (The Big Mama Blog). Melanie and Sophie Hudson (Boo Mama) put out this podcast every few weeks and it’s absolutely hilarious. It’s literally like you are listening in on a phone conversation between them- they obviously have no outline or plan to what they are going to talk about, and they just bounce from one topic to another. Sometimes they shop online while they podcast. They talk about mascara A LOT. This podcast just makes me happy (and laugh, a lot). . Serial Obviously, I had to include this one. But full disclosure- as captivated as I was by Season 1, I just couldn’t get on board with Season 2. But Season 1- swoon. This American Life Each week, this show has a theme and then all the stories they share revolve around that theme. There are weeks I’ll listen and can’t get some of the stories out of my head for days and days. Such great stuff. Mystery Show A fun, quirky podcast where the host solves a “mystery”- which are all kind of trivial, but the episodes are riveting. A Slob Comes Clean I’ve just started listening to this one. Awesome tips on de-cluttering, simplifying and dealing with routines and STUFF. Very timely as we are getting ready to move. Mud Stories with Jacque Watkins This is another new one to me. Jacque interviewed Jamie Ivey a few weeks ago and that’s how I found it. Each episode is the story of someone with a “Mud Story”-some kind of suffering they’ve gone through and what it’s taught them and how it’s changed their life. Heavy stuff, but I love it. Be sure you listen to Jacque’s story- episode 61. Do you listen to podcasts? Have any must-listen ones I am missing?! 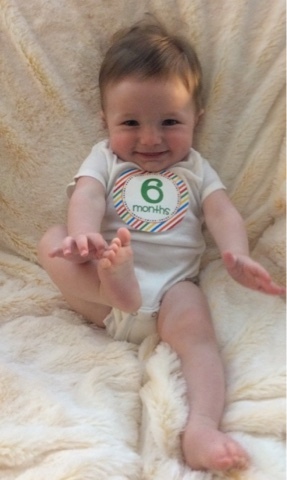 Happy half birthday to you! 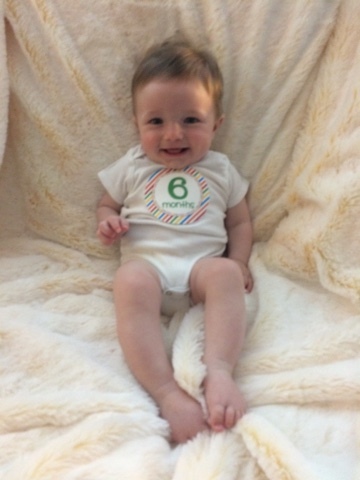 You have officially reached my very favorite age: 6 months! While I am sad and wistful that you are no longer a teeny-tiny newborn, I am absolutely loving your emerging personality and the extended periods of time that you are HAPPY these days. Yes, that’s right. Fingers crossed and prayers lifted that we are past the days of your constant crying. You still have your moments, but now that you can hold your head up during tummy time, hold your own bottle, and entertain yourself in the excersaucer. Life is a lot calmer and quieter around here lately. Are drinking mostly bottles now. You still nurse before bed, in the morning and when you wake in the night, but are drinking 6 ounce bottles of formula during the day. And I’m totally good with that- it works for us. Haven’t had any solids to eat yet. I plan on doing Baby Led Weaning again like I did with Charlotte, so we will wait until you can sit independently before we start- I’m thinking another few weeks. Go to bed around 5:15 pm, wake up once in the night and are up for the day around 6:00 am. 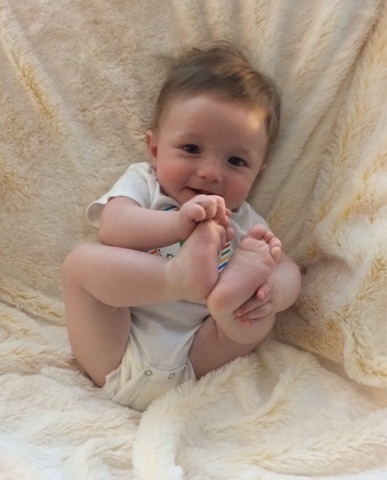 Can grab things and pick up toys off the floor easily now- and you love to grab my hair- ouch! Met your new baby cousin Winnie- you only held the position of youngest in the family for a little more than 5 months. Nolan, every day I fall more and more in love with you. Happy 6 months to my Noly Poly!